FORTALEZA: Guillermo Ochoa threw up an impenetrable shield around his goal as stubborn Mexico frustrated World Cup hosts Brazil to earn a 0-0 draw on Tuesday. The Mexican goalkeeper pulled off an incredible diving stop from a Neymar header and a series of other extraordinary saves, holding up Brazil's march toward qualification from Group A. The 28-year-old, who has no club as his contract with French club AC Ajaccio has ended, did a lap of honour around the Fortaleza Castelao Stadium after one of the great World Cup goalkeeping performances. Basketball hero Kobe Bryant hailed "OCHOA!! Incredible" in a Tweet within minutes of the game ending. Ochoa's wikipedia page was hacked to hail him as "the Mexican Jesus after his performance against Brazil." The precious draw left Mexico level with Brazil on four points from two games. 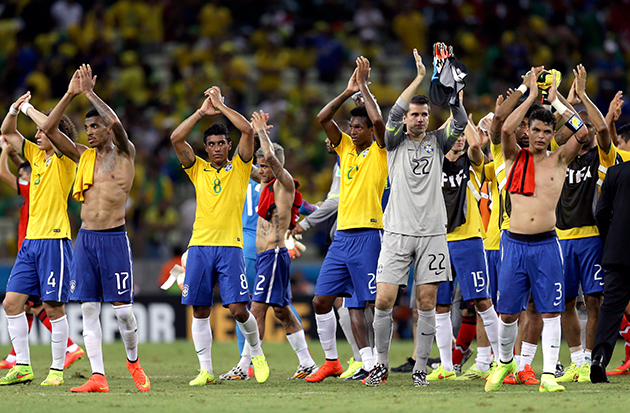 While Ochoa deservedly grabbed the headlines, Brazil finished the game relieved to have earned a point. Mexico had several late chances to score a shock upset, with Brazil grateful to their own goalkeeper Julio Cesar for keeping the match goalless. The draw maintained Mexico's impressive recent record against Brazil following their shock victory in the final of the London Olympics football tournament in 2012. The result leaves Group A finely balanced. 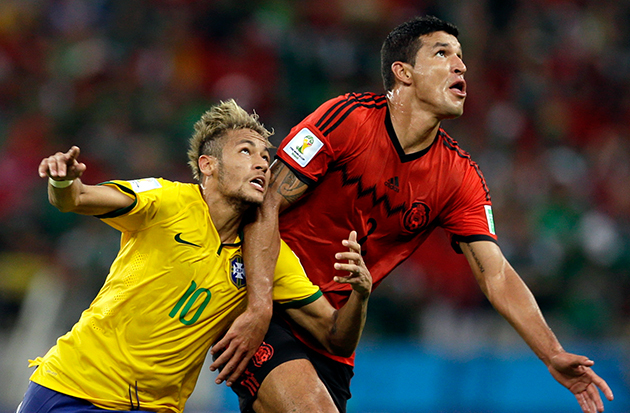 Brazil face Cameroon in their final match while Mexico play Croatia. Earlier, Belgium staged a late fightback to beat Algeria 2-1 and deny the Africans a first World Cup win in 32 years on Tuesday. Second-half goals from substitutes Marouane Fellaini and Dries Mertens secured an opening Group H victory for the Red Devils after Algeria had taken a 25th-minute lead with a Sofiane Feghouli penalty. Manchester United midfielder Fellaini headed Belgium level on 70 minutes before Mertens struck 10 minutes later, latching onto a sublime pass from Eden Hazard and blasting home past Algerian goalkeeper Rais M'bolhi. Algeria, who have not won a World Cup match since beating Chile at the 1982 finals in Spain, will now look to break their winless streak against South Korea or Russia, who play later on Tuesday. Belgium coach Marc Wilmots, the last Belgian player to score a goal at the World Cup in the 2002 finals, is hoping to make a big impact in Brazil. His Belgian side is seen as one of the most promising squads in international football, with a generation of talented players including Chelsea star Hazard, Manchester City defender Vincent Kompany and a slew of other foreign-based players. The late game in Group H pits South Korea against Russia. South Korea's fortunes have nose-dived since 2002 when they turned the form book on its head by becoming the first Asian side to make it through to the semi-finals. But before reaching their eighth consecutive World Cup, they struggled in qualifying, squeaking home only on goal difference. Coach Hong Myung-Bo gained iconic status in Seoul after his side-footed penalty took Guus Hiddink's side into the 2002 World Cup last four. Russia are back in the World Cup for the first time since 2002, when like in 1994 they failed to make it out of the group stages. Under Fabio Capello, who guided England to the last 16 in South Africa four years ago, Russia coasted through qualifying and in stark contrast to South Korea are unbeaten in 10 games. Meanwhile, the fall-out from Monday's action, which saw Germany rout Portugal 4-0 and African champions Nigeria labour to a 0-0 draw with Iran, continued. Portugal denied midfielder Raul Meireles gave the referee the finger in his side's stormy loss, insisting that he was merely gesturing a tactical switch. Pictures on social media show Meireles, who sports a distinctive Mohawk hairstyle, raising the third finger on both hands to referee Milorad Mazic who had sent off Real Madrid defender Pepe. But the the Portuguese football federation (FPF) defended the Fenerbahce player, claiming there was nothing vulgar about the gesture.